Because when the Kansas City Roller Warriors hit the track… we all win. Last night’s bouts at Municipal Auditorium were memorable, to say the least. For starters, the Victory Vixens mauled the previously-unstoppable Dreadnought Dorothys 166-50 in the first game I’ve ever seen the Ruby Reds drop. The second game came down to the last few seconds on the jam clock and saw the Black Eye Susans, with Mash Hun wearing the star, pull out the last few points they needed to steal the win away from the dramatically improved Knockouts by a score of 86-83. 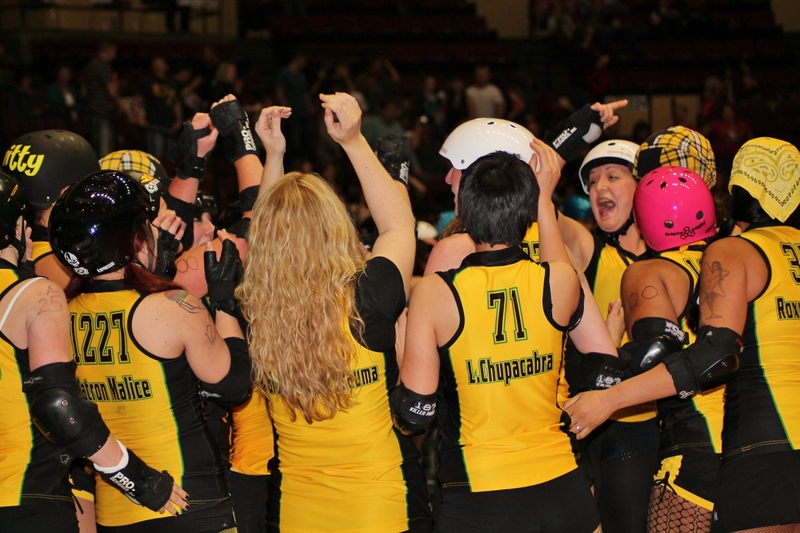 It was an absolute heart attack, and I feel for any roller derby fan who wasn’t there to see it last night. We will, of course, have our recap and photos posted within the next day or two, but in the meantime, this is what victory looks like. My fave moment was evolution distractinge a dorothy jammer with eye contact of death while black ice landed a game ending hit out of no where! Sounds like it was awesome! Wish I could have been there!